Ukrainian Carpathians: you thought this was somewhere in Eastern Europe? | See you in Ukraine! Ukrainian Carpathians: you thought this was somewhere in Eastern Europe? After crossing the Slovakian-Ukrainian border and on the way from town of Uzhhorod to Rakhiv in Western Ukraine you will probably notice a sign which says the following: “A permanent, precise, eternal place. The Center of Europe, defined with great precision by means of a special device made in Austria and Hungary with a scale of meridians and parallels. Year 1887”. 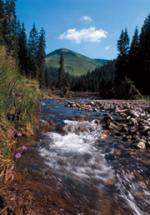 The Carpathian Region is one of the best tourist attractions in Ukraine. The Carpathian Mountains with their powerful fur-trees and beech woods, fast water steams, sparkling waterfalls, transparent lakes, picturesque valleys called “polonyna” by natives, colorful towns and villages have long been admired by travellers. The Carpathian region is a crossroad of various cultures: Ukrainian, German, Hungarian, Slovak, Romanian, Russian, and Jewish. This land has much of a turbulent history. Here flags have changed more often than generations. This area once was a part of Halytsko-Volynske Principality, afterwards under Austrian Empire. This had caused its towns to have a typical European look. A great number of old monasteries and cathedrals of various religious confessions, pre-history ethnic settlements, medieval palaces and fortresses have been preserved in this land since ancient times. The Khotyn Fortress (XI-XIII centuries), is known in history to be the place of united Slavic tribes to have won over 150 thousand Turkish army and have protected Western Europe from enslavement. A legendary city of Lviv founded in XIII century is a real open air museum with numerous cultural, architectural landmarks of different epochs. Most known among them are St. Nicolas Church (XIII c.), St. Bernard’s Monastery, Armenian Church (XIV-XV centuries), St. George Cathedral (XVIII c.). A unique museum especially constructed to preserve and exhibit Easter egg paintings is awaiting you in a small town of Kolomyia. The museum was constructed in a shape of an Easter egg made of colorful glass. It is also called a Stained-Glass Easter Egg. The Museum owns a collection of over 6000 exhibits. Its masters have invented methods of Easter eggs maintenance and restoration. The Carpathians biggest lake is the fabulous Synevyr. The legend says it appeared in result of a true love of a girl named Syn’ and a lad called Vyr. And since then those who declared of love at this place would never fall apart. Nearby the tiny town of Hust lies the Valley of Narcissuses (daffodils). 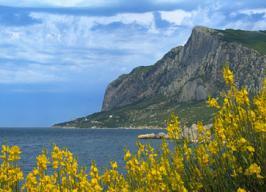 The only chance to see the untouched reserve of this tender flower in Europe is here. And if you are interested in caves, you should visit a unique natural labyrinth of the Cinderella Cave not far from town of Podvirne. By now just 85 km of the labyrinth have been explored. Even though it is the third among gypseous and eleventh of all world’s caves by its length. According to Ukrainian speleologists, Cinderella will soon overtake the longest in the world The Mammoth Cave. Alongside with its fascinating architecture, the Cave has a mystery of its own - a rare mineral bjornescit, its composition being still a subject to scientific research. Before the Cave was disclosed, this mineral had been found only in oceanic bottoms, so that on the surface it can be seen only here. In the Carpathians one can combine a relaxation in harmony with nature, variable cognitive opportunities with decent recreation. This area has long been famous for its mineral springs. Only in Trans-Carpathian region they number over 400. A well known Ukrainian “water” resort is Truskavets with its unique curing mineral water “Naftusia” famous for its organic composition. The Carpathians offer also mountain climbing, horse riding, and in winter – skiing and sledging. Here you are welcome any season.